The new panel for Emsingen is built and functional. All powered switches in Emsingen can now be controlled using the same logic I deployed in Talheim, along with routes and appropriate semaphore signaling. The red buttons control routes and semaphores. The logic works by first pressing the button FROM where the train is coming, then the button TO where the train is going. The computer/JMRI take care of throwing the right turnouts and set the appropriate signals, including speed signaling for diverging vs. straight routes. The black buttons control the turnout at the respective location. 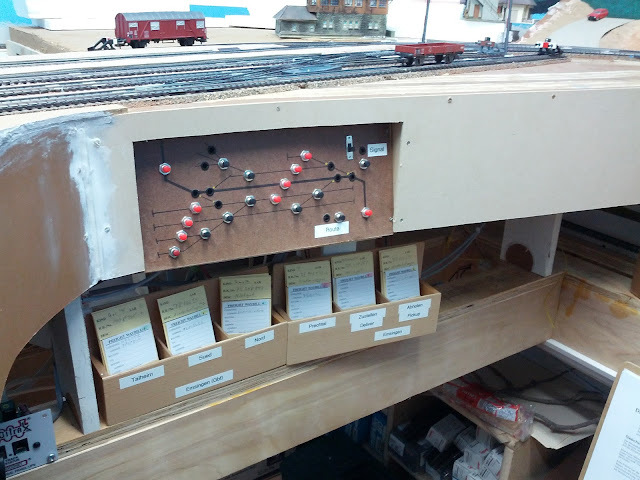 The story here goes that turnouts with black buttons are hand-thrown by the switching crew, while turnouts off the mainline are thrown by the tower operator. The red buttons on the yard ladder line the yard turnouts so that the respective yard track can be reached from the switch lead. I have not yet put together the indicator LEDs for the mainline turnouts and various control indicators. I'll do that for the Talheim panel first, Emsingen next, and finally the various turnouts in staging. The fascia still needs some paint. Another day... I haven't run trains in a while, so the tracks in staging are all gunked up in various places and need some thorough cleaning.